A trial lesson will give you a feel for flying a helicopter and could be the first step towards gaining your helicopter pilot’s licence (PPLH). With Flying Pig you’re getting the best of the best too! 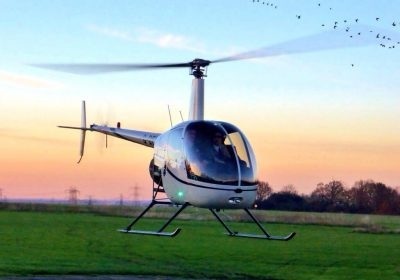 – We are a dedicated Helicopter Approved Training Organisation based at London Elstree Aerodrome in the Hertfordshire country side, just a stones throw away from the London skyline, enjoying an unrivalled reputation for quality of training. A trial lesson is the perfect opportunity to get a feel for what’s its like to fly a helicopter and if training to be a pilot is really for you. Choose from 3 aircraft types – the Robinson R22/R44 or Guimbal Cabri G2 and one of our instructors can assess your aptitude and ability. Afterwards, we’ll discuss how we can structure your training to suit your budget and availability, taking full advantage of our tailor-made programmes and giving you the best chance of achieving your ultimate goal – becoming a Captain! Take your first step by booking your trial lesson, with prices starting from £178 for a 30 minute experience with a 15 minute pre-flight briefing and a further 15 minutes ‘rotors turning’ to kick off with? That’s all it costs to get up in the air and in control! For more info on this and all our trial lessons please visit our ‘shop’.